Fig. 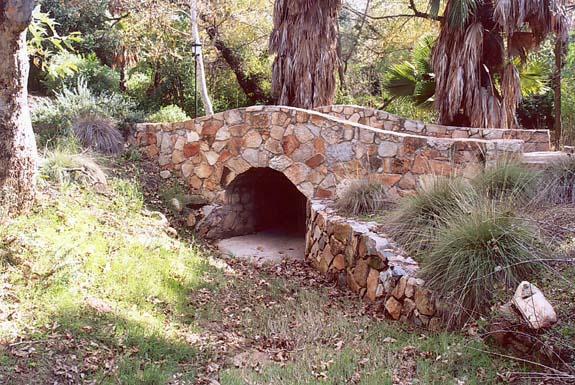 1 Pedestrian bridge over Kumiai Creek in Tecate, Baja California, Mexico. 1. WHAT ARE THE RETURN PERIODS COMMONLY USED IN DESIGN? In hydrology, design return periods vary typically from 10 yr to 100 yr, and in countries (or places) where the Probable Maximum Precipitation (PMP) has not been defined, up to 10,000 yr. The choice of return period depends on various factors, including the size of the drainage area, the risk of failure, the importance of the structure, and the desired degree of conservatism. 2. WHAT IS THE LOWEST RETURN PERIOD? The lowest return period, applicable in urban drainage, is 5 to 10 years. Typically, these return periods are associated with drainage areas smaller than 100 ha. For these areas, the rational method may be used to develop a peak discharge. In certain cases, particularly for areas exceeding 100 ha, longer return periods may be warranted. 3. WHY DOES URBAN DRAINAGE USE SHORT RETURN PERIODS? In small watershed hydrology, the peak discharge is related to the rainfall intensity, which in turn is related to the time of concentration (through the applicable intensity-duration-frequency curves). Small drainage areas will have a short time of concentration and this will produce a high intensity and high peak discharge per unit of area. However, since the area is small, the peak discharge is correspondingly small. Thus, for small areas, with time of concentration measured in minutes, it is usually not economical to design for long return periods. 4. WHAT IS THE RETURN PERIOD FOR REGIONAL FLOOD PROTECTION WORKS? Regional flood protection works are structures such as levees, which encompass great lengths and correspondingly large drainage areas. In this case, the return periods may vary between 50 and 100 yr. The time of concentration is much larger, say a few hours, and the rainfall intensity is correspondingly smaller, resulting in a comparatively low peak discharge per unit of area. However, the peak discharge may be large, reflecting more the size of the drainage area than the rainfall intensity. Fig. 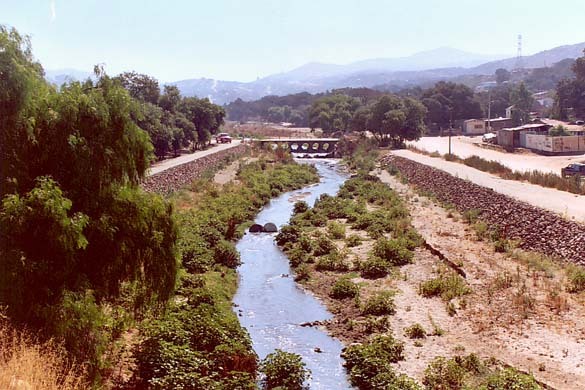 2 Levees on Tecate Creek, Baja California, Mexico. 5. WHAT IS THE RETURN PERIOD FOR HIGHWAY DESIGN? For highway drainage design, the choice of return period depends on the importance of the structure. Return periods in highway and other regional transportation infrastructure, including culverts, typically vary from 25 to 100 yr. It is unusual for highway drainage to use return periods longer than 100 yr.
6. WHAT IS THE RETURN PERIOD FOR BRIDGE DESIGN? In the case of river-spanning bridges, the focus shifts from the size of the drainage area to the importance of the structure and the risk of failure. For the design of bridge piers, return periods up to 500 years may be justified, depending on the individual case. Fig. 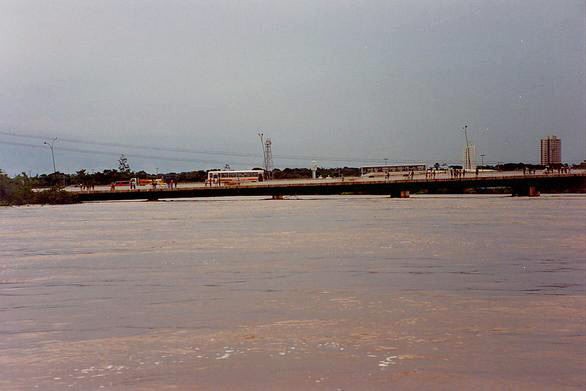 3 Flood stage on the Cuiaba river, Mato Grosso, Brazil, on January 10, 1995. 7. WHAT IS THE RETURN PERIOD OF 100 YEARS? The return period of 100 yr amounts to four human generations. It is a number which is not too high, nor too low. The value of 100 yr does not mean that the structure will be at risk exactly every 100 yr. Rather, it means that the structure will be at risk, say 10 times every 1000 yr. The 100-yr flood peak applies for flood plain development, medium-sized flood protection works, and regional urban drainage facilities. As a rule, the larger the drainage area, the longer the return period. Typically, drainage areas less than 250 ha do not warrant return periods greater than 25 yr. However, larger areas, up to 10,000 ha and beyond, may justify return periods up to 100 yr or longer. 8. WHAT IS THE PMP? PMP stands for Probable Maximum Precipitation. Even though its name implies a probability, in effect the first P in PMP is to be interpreted loosely as "possible". The PMP is a reasonable maximization of the event precipitation expected at a given geographical location, for a given duration. PMP estimates, including generalized and statistically based, have been made in the United States since the early 1960s. 9. WHAT IS THE RETURN PERIOD OF 10,000 YEARS? In countries lacking a generalized PMP, it is common practice to use the return period of 10,000 yr in lieu of the PMP. The value of 10,000 yr has been used for many decades to designate the maximum return period to be used for hydrologic design. It is a de-facto equivalent of a practicable maximum value. 10. CAN THE PMP DIFFER FROM THE 10,000-YR ESTIMATE? The statistically based PMP is used in places where the generalized PMP is not available (Ponce, 1989, p. 454). It is not uncommon for a statistically based PMP to be different than a statistically based P10,000. 11. WHEN ARE RETURN PERIODS UP TO 10,000 YEARS USED? For places where generalized PMPs have not been developed, and where risk of failure places human life in jeopardy, return periods in excess of 100 years, to include 200, 500, 1000, 2000, 5000, and 10,000 are warranted. 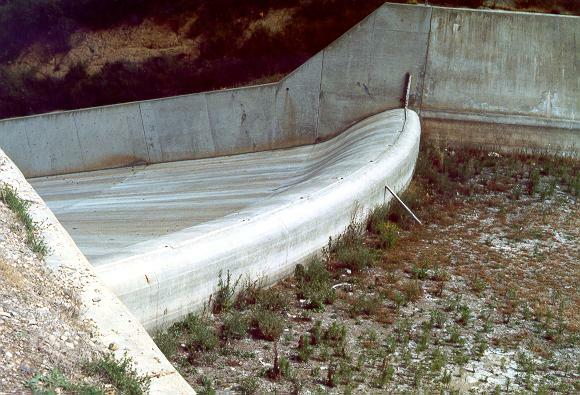 Values up to 10,000 years are used for emergency spillway and freeboard hydrographs in dam design. Fig. 4 Spillway at Turner dam, San Diego County, California. 12. WHAT RETURN PERIODS BEYOND 100 YEARS ARE USED IN THE UNITED STATES? In U.S. hydrologic practice, return periods up to 100 yr are used. Beyond this threshold, design precipitations are taken as the sum of the P100 plus a fraction of the difference between the P100 and the PMP. For instance, for a class (c) dam, the Natural Resource Conservation Service (NRCS) specifies a precipitation for an emergency spillway hydrograph equal to 100% of the P100 plus 26% of the difference between the PMP and the P100 (NRCS TR-60: Earth dams and reservoirs). Effectively, this means that the design precipitation is a weighted average of the P100 and the PMP. These precipitations are used, in the context of a rainfall-runoff model, to calculate the design flood hydrograph. For a class (c) dam, the PMP is used to calculate the PMF (Probable Maximum Flood) or freeboard hydrograph, i.e., the flood that would take up the entire freeboard. 13. WHAT IS THE RETURN PERIOD OF A FLOOD RESULTING FROM A DAM BREACH? The return period of a flood peak resulting from a dam breach depends on the volume stored in the reservoir and the time of breach development. If the latter is short, say less than 1 hour, the resulting flood peak could have a return period longer than 10,000 yr. Thus, it is important to design the dam to make sure that the spillway is able to pass an extreme flood. Fig. 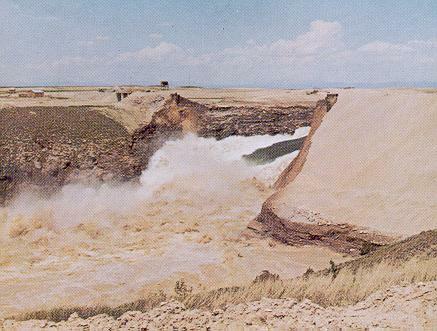 5 Failure of Teton Dam, on the Snake River, Idaho, on June 5, 1976. 14. CAN RETURN PERIODS VARY WITHIN THE SAME PROJECT? Yes. When all other factors are the same, the chosen return period depends on the size of the drainage area. The smaller the drainage area, the shorter the return period; conversely, the larger the drainage area, the longer the return period. Therefore, smaller areas within a given watershed/basin will have shorter return periods, say 10 yr, while larger areas will have longer return periods, say 25, 50, or even 100 yr. The rationale for varying the return period (within the same project) is that the probability of occurrence of a certain rainfall intensity increases with a decrease in drainage area. Thus, it is more likely for smaller areas to be hit with high-intensity rainfall than larger areas. Designing an entire urban drainage project (with areas varying from a few hectares to hundreds of hectares) with the same return period can lead to underdesign on the larger areas (if a short period is used) or overdesign on the smaller areas (if a long period is used). 15. HOW WILL GLOBAL WARMING AFFECT THE DESIGN? Under various global warming scenarios, climatological patterns are expected to change. Some regions will dry out, while others will become wetter. The entire precipitation record could be a risk of obsolescence. An existing or planned design, based on the available record, will become less conservative under a change from humid to arid (desertification), and more conservative under a change from arid to humid (humidification). Fig. 6 Global 2005 surface temperature anomalies (Source: NASA). 16. WHO CHOOSES THE RETURN PERIOD? The return period is chosen by the designer, in consultation with the owner, following established hydrologic practice. An assessment of risk is paramount to the selection of return period. Table 1 may be used as a guideline, when used in conjunction with local regulations and experience. Table 1. Guidelines for the selection of return period.